Home / QuiBidder of the Week – Asya H.
This week’s featured QuiBidder is Asya H. from the United States. 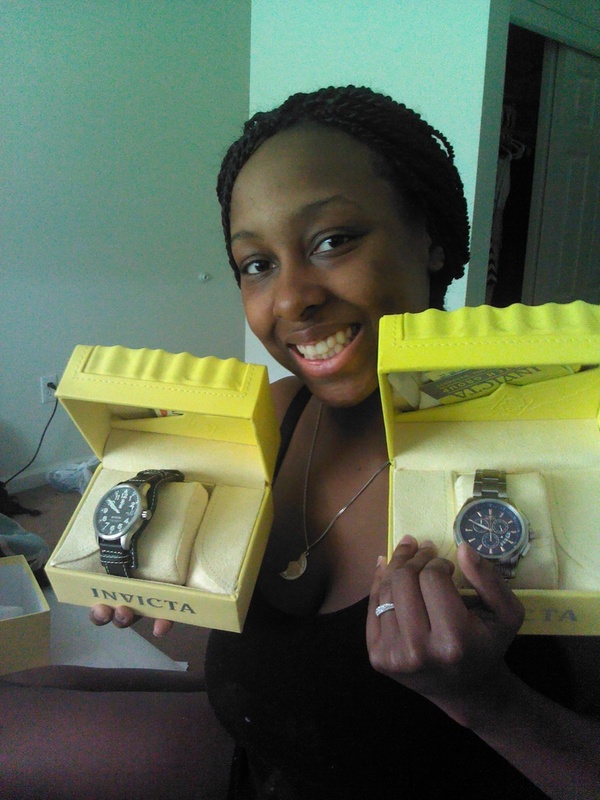 In the photo below, Asya is wearing a smile almost as huge as the deals she won on QuiBids because she paid less than two dollars for both Invicta Watches she’s wearing! The watches’ retail value adds up to around $890! You don’t need a calculator to see that these are some incredible savings! QoW 15 – A.J. A.
QoW 14 – Suzanne P.
How did Asya score so many great wins? In the last sentence of Asya’s QuiBids story, she explained that she looks on QuiBids before purchasing a product at retail elsewhere. This is why your number-two favorite bidding tip, according to our QuiBids 101 poll, is to “Go into an auction expecting to pay retail.” The Buy Now feature on QuiBids allows you to apply your spent bids toward purchasing the product at retail. This way if you lose an auctions your spent bids are not wasted. They are simply discounted from the retail price of the product. For example: Say you intend to purchase a 3D HDTV for your loved one’s birthday. You’ve got two options. You could pay retail and purchase the exact same TV from a traditional store, or you could try to win it from QuiBids for up to 99% off MSRP. If you don’t win you can still purchase the HDTV at retail with QuiBids’ Buy Now, but that’s not as fun now, is it? Still have questions? Check out the QuiBidder of the Week Guidelines. QuiBidder of the Week – Lisa D.
QuiBidder of the Week – Greg W.
QuiBidder of the Week – Shereese M.